Let's see if husband thinks my sanity is completely gone after this purchase. 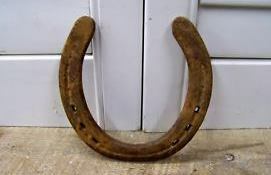 A steal, for an old, dirty, rusty horseshoe, right?! Had I known you were looking for one I could have brought you back a few from ND for FREE! Can't wait to see what you make of it.